It came out of nowhere. On Sunday evening around 7pm in Fort Collins, Colorado, a tow truck driver got a call to simply remove a vehicle that was illegally parked at the Pier Apartments at 4501 E. Boardwalk Drive. The vehicle that was illegally parked had been blocking another vehicle, explains Sgt. Dean Cunningham of the Fort Collins Police. The tow truck driver from H&K Towing arrived at the scene and began to hitch up the vehicle for transport. That’s when a strange and frightening sight suddenly appeared in the night. 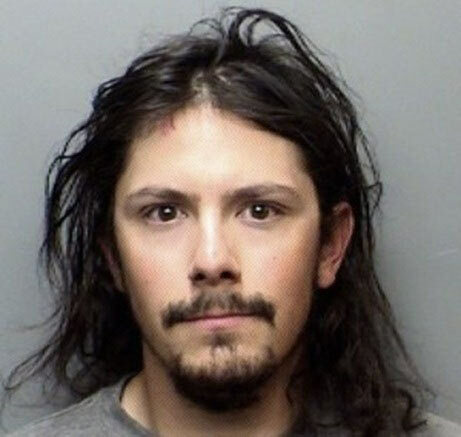 A man hurled out of the apartment building, dressed in a gas mask, ballistic helmet and Kevlar vest, wildly wielding a samurai-style sword as he came charging towards the tow truck driver. Sgt. Cunningham then says that according to witnesses, the man immediately swung the sword at the tow truck driver, luckily missed him, then sliced one of truck’s tires and again tried to get another stab at the tow truck driver. The driver was lucky to only be nicked by the sword as the two men scuffled, before bystanders were finally able to tackle the sword-swinging ninja and keep him restrained him until police arrived. While the truck driver was obviously shaken up, he was treated and released at the scene. Obviously the strange and violent ninja wasn’t so lucky. With his gas mask off, 27-year-old Jeremiah Proctor was arrested and immediately taken into custody. The arrest reports indicate that Proctor was wearing "U.S. Army apparel" and had "assault rifle magazines and knives" with him in addition to the sword he was swinging at the operator. He was charged with suspicion of attempted first-degree assault, felony menacing and criminal mischief. Bond was set at $5,000 and his next court date is scheduled for Nov. 19. Although Sunday’s attack was unprecedented and it has yet to be established if Proctor even owned the vehicle being towed, attacks on tow truck drivers aren’t uncommon. A few years ago a man was so upset that his Lexus sedan was being towed, that he viciously beat the tow truck driver to the point that he was unconscious. His brain was bleeding, his face bones were fractured and as he was left laying on the sidewalk for dead, the angry driver tried to retrieve his Lexus from the hitch, but didn't know how to operate the tow truck controls so he fled on foot. Fortunately the tow-truck driver later recovered after being in critical condition and the Lexus driver was eventually caught, arrested and charged. Do you think tow truck drivers are at more risk because of the nature of their job, or do cargo truck drivers face other dangers as well?